A NewVistas community is organized according to a private capitalistic economic structure. 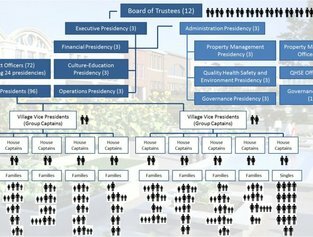 The community is not a political entity but a productive enterprise, like a company town, with the ability to select its own participants. A capital fund (NewVistas Capital) funds businesses and holds intellectual assets. A property holding company (NewVistas Property Holdings) manages physical assets and arranges for business services. Productive business enterprises in the community (VistaBizzes) are separately owned legal entities. PowerPoint (Belliston 2015) describes the elements of the NewVistas local economy. Complete local economy of hundreds of small businesses, supported by a trust, a for-profit capital company, and a for-profit property holding company. Paper (NVF Belliston) provides a preliminary list of types of business enterprises that might be part of a NewVistas community. Paper (Belliston 2010) explains how NewVistas differs from a political entity.